Rider numbers for the Badass 2013!! Did you know that the last 17 miles of the Bowland Badass route are purely there because they’re part of one of the Professor’s old training rides and he wanted some familiar territory for when he finished riding the Badass himself? Of course these final, gnarly back roads may not be familiar to you, and all you will experience is the agony of passing multiple signposts indicating Garstang is only 4 miles away when you know you have at least 3 times that distance to ride. What horror! We suggested to the Prof that he might like to modify the route slightly to ease your suffering, but that crinkle cut crispy-skinned curmudgeon turned the air completely blue with a ranting diatribe composed purely of a string of filthy expletives. How very rude! So, the route is unaltered, and will remain so in perpetuity, or at least the Prof has turned his final pedal…….. However, we did manage to get him to accept a startling new innovation: numbers for the bikes of riders. Yes, for no extra cost entrants will be supplied on the day with a number on a little piece of laminated card that they can attach to their handlebars so we know who they are. As you can see, we on the Badass team like to surf the frothy wave of fashion and are not at all a bunch of grumpy, old codgers. It took TechnicalExpert quite a while, and a number of attempts, to come up with the perfect combo of visibility, minimal wind resistance, and style. 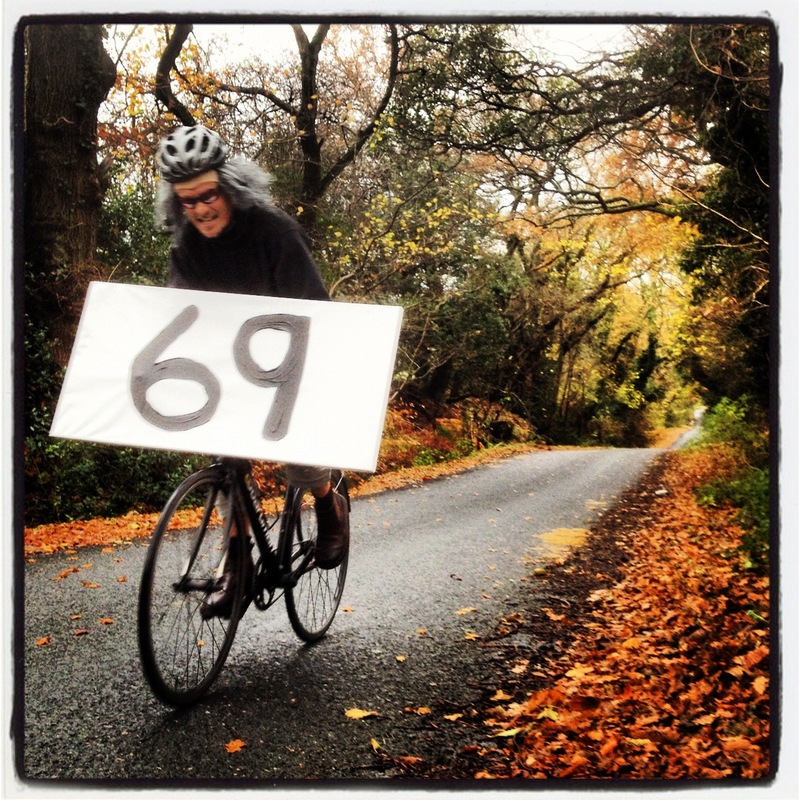 Below you can see the Prof testing out an early prototype on Long Lane Hill at the end of a long and bumpy club ride……. Posted on November 21, 2012, in News and tagged Bowland Badass, Garstang, Long Lane. Bookmark the permalink. Leave a comment.